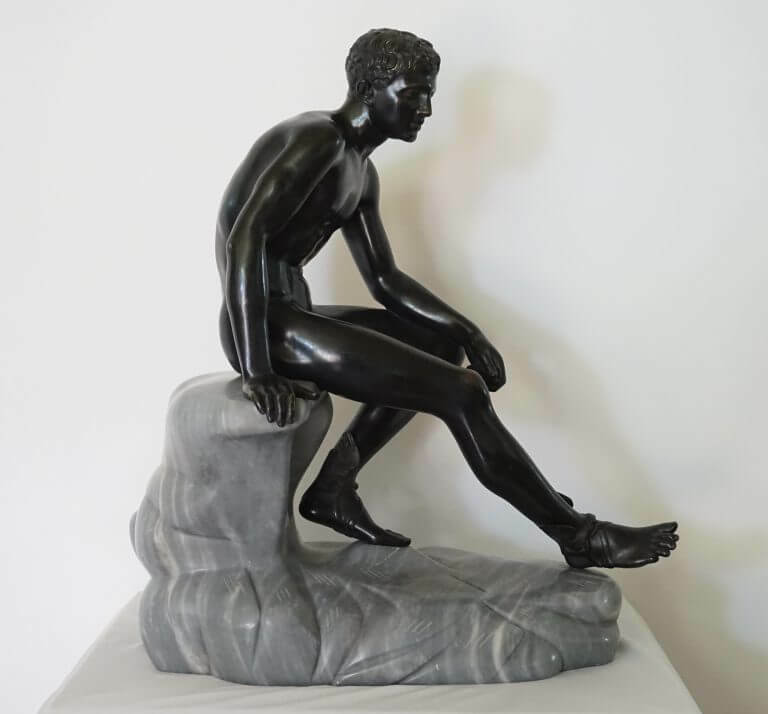 A large and exceptional Grand Tour sculpture of the ‘Seated Hermes’ attributed to the Chiurazzi Foundary, Naples, Italy, circa 1890. 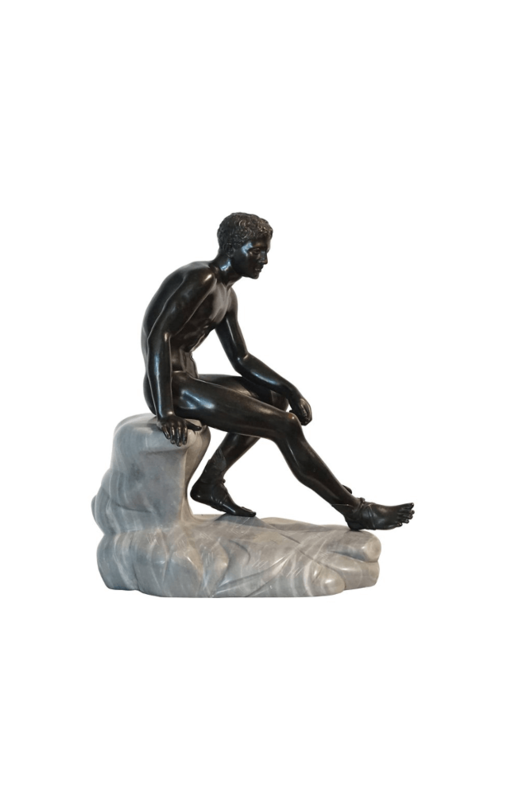 The solid lost-wax cast bronze figure seated atop a naturalistically carved Turquin Blue Bardiglio marble base. 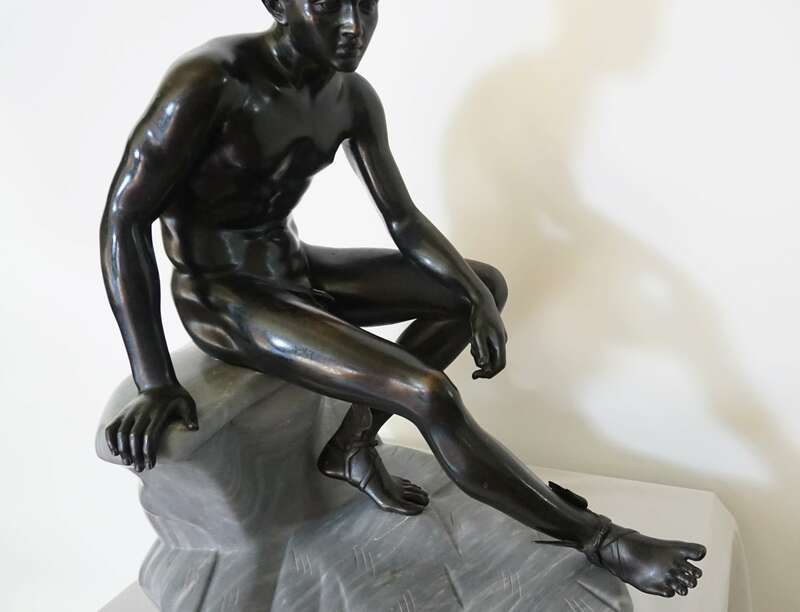 The Greek god Hermes was the son of Zeus and the Pleiad Maia; the second youngest of the Olympian gods, and adopted by the Romans as Mercurius (Mercury); the patron of commerce. 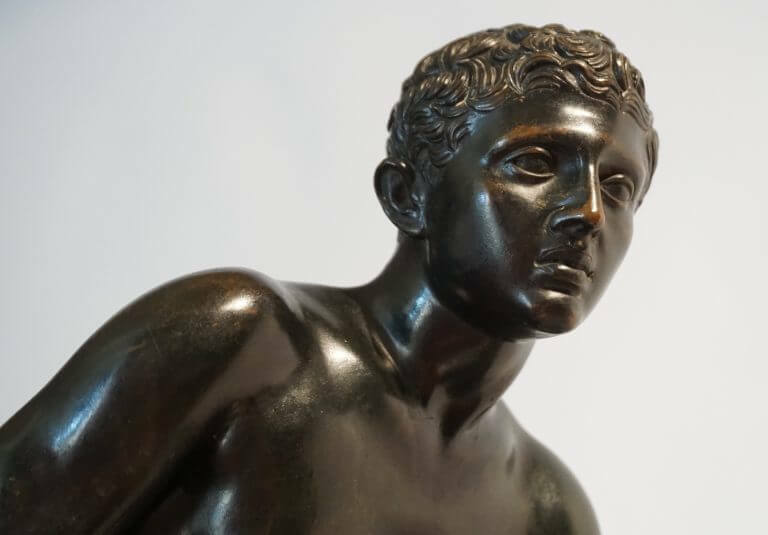 The original ancient ‘Seated Hermes’, now at the National Archaeological Museum of Naples, was found at the Villa of the Papyri in Herculaneum in 1758 and was a Roman copy made before 79 CE of a Greek bronze original, circa 100 BCE. 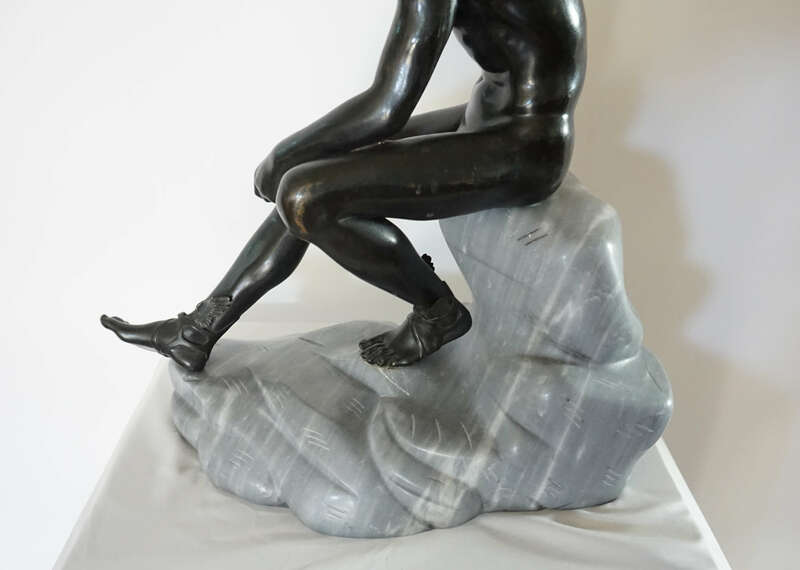 The ‘Seated Hermes’, according to British art historians Francis Haskell and Nicholas Penny, is considered the most celebrated work of art discovered at Herculaneum and Pompeii in the 18th century, after four large engravings reproducing it appeared in Le Antichità di Ercolano in 1771. This example exquisite in detail and condition. 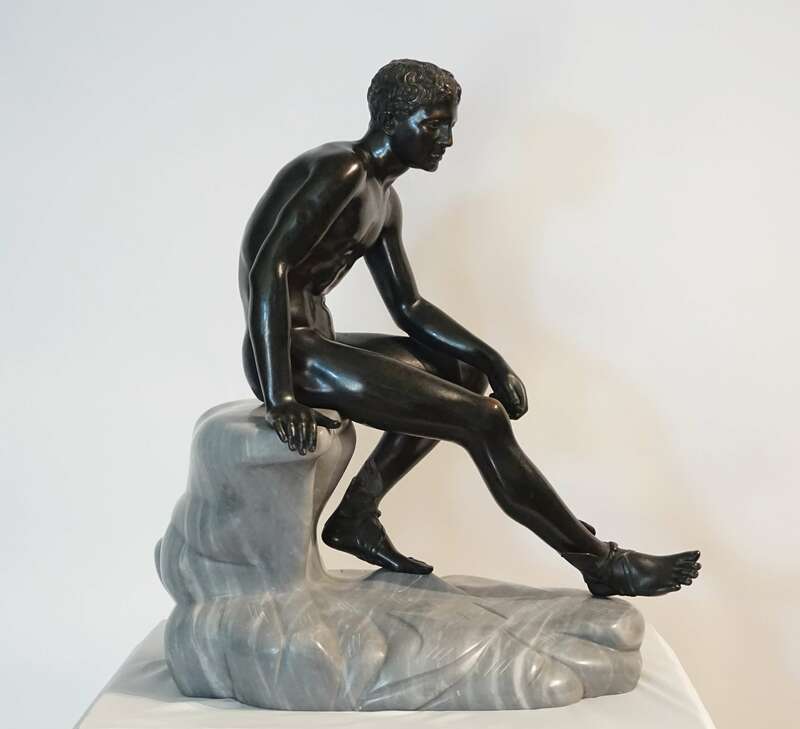 Literature: Margarete Bieber, “The Sculpture of the Hellenistic Age”, Columbia University Press, New York, 1961, figs. 106-07. 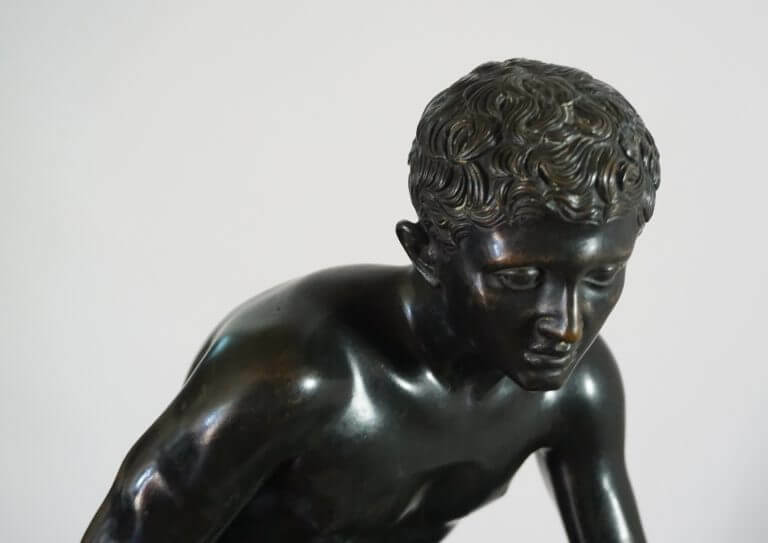 Francis Haskell and Nicholas Penny, “Taste and the Antique: the Lure of Classical Sculpture 1500-1900”, Yale University Press, New Haven, 1981, p. 267. Le Antichità di Ercolano Esposte (The Antiquities of Herculaneum Exposed), Accademia Ercolanese (Herculaneum Academy), Regia Stamperia, Napoli (Naples), 1771, Volume VI, pp. 113-22. Excellent. Light wear consistent with age. 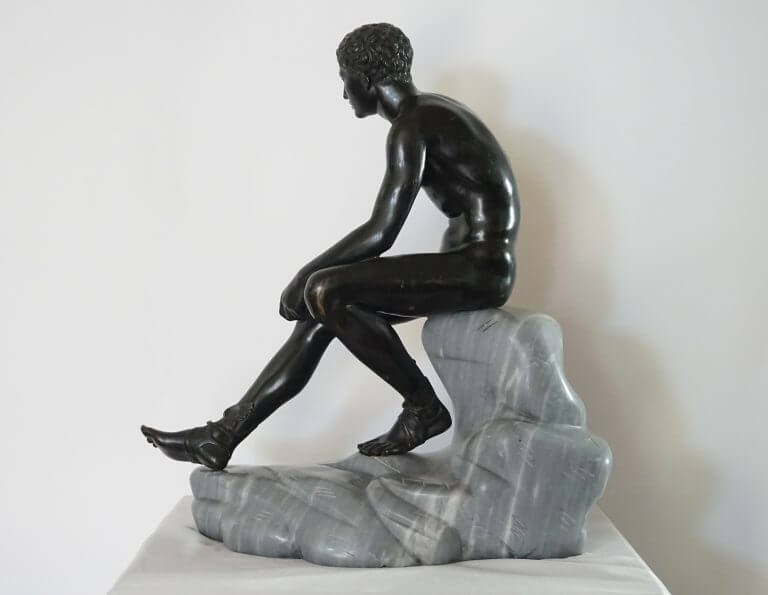 A large and exceptional Grand Tour sculpture of the ‘Seated Hermes’ attributed to the Chiurazzi Foundary, Naples, Italy, circa 1890. 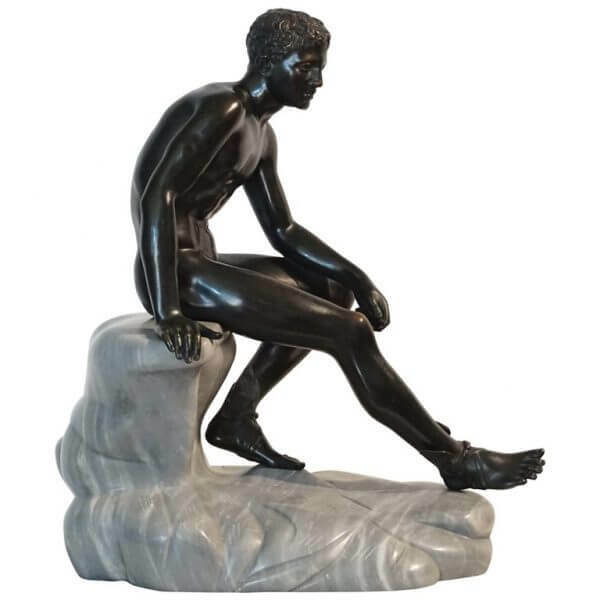 The solid lost-wax cast bronze figure seated atop a naturalistically carved Turquin Blue Bardiglio marble base. 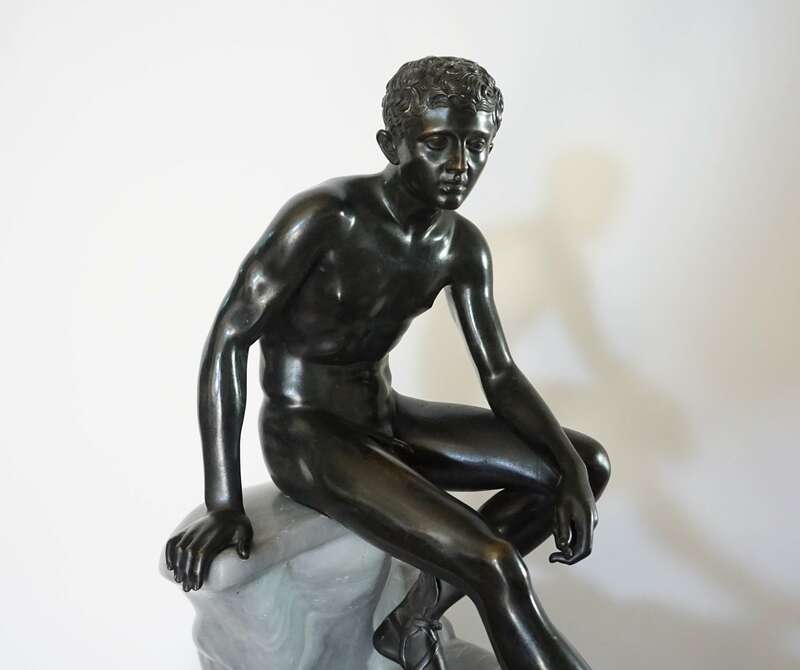 The Greek god Hermes was the son of Zeus and the Pleiad Maia; the second youngest of the Olympian gods, and adopted by the Romans as Mercurius (Mercury); the patron of commerce. The original ancient ‘Seated Hermes’, now at the National Archaeological Museum of Naples, was found at the Villa of the Papyri in Herculaneum in 1758 and was a Roman copy made before 79 CE of a Greek bronze original, circa 100 BCE. 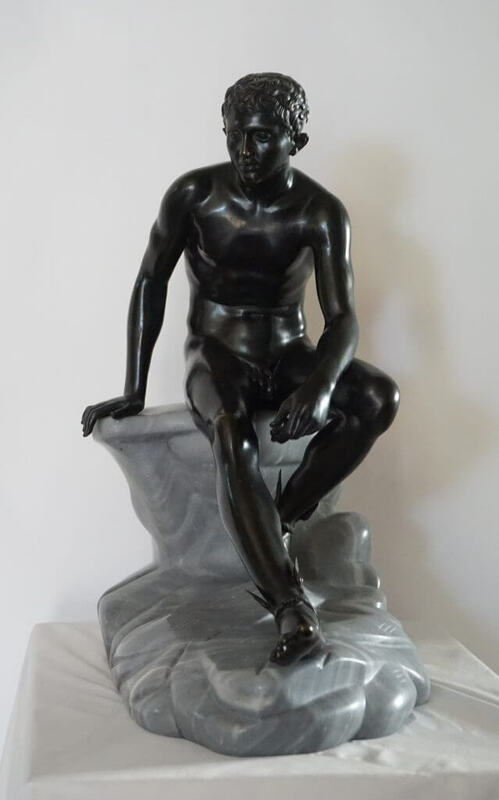 The ‘Seated Hermes’, according to British art historians Francis Haskell and Nicholas Penny, is considered the most celebrated work of art discovered at Herculaneum and Pompeii in the 18th century, after four large engravings reproducing it appeared in Le Antichità di Ercolano in 1771. This example exquisite in detail and condition. Margarete Bieber, “The Sculpture of the Hellenistic Age”, Columbia University Press, New York, 1961, figs. 106-07. 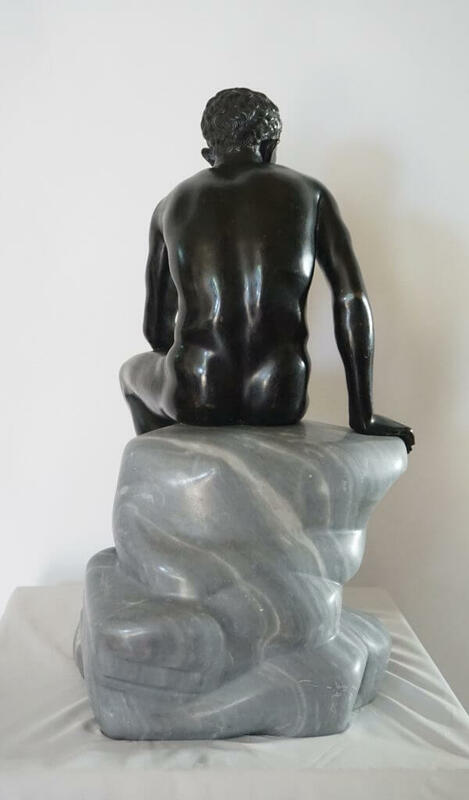 Francis Haskell and Nicholas Penny, “Taste and the Antique: the Lure of Classical Sculpture 1500-1900”, Yale University Press, New Haven, 1981, p. 267. Le Antichità di Ercolano Esposte (The Antiquities of Herculaneum Exposed), Accademia Ercolanese (Herculaneum Academy), Regia Stamperia, Napoli (Naples), 1771, Volume VI, pp. 113-22. Condition: Excellent. Light wear consistent with age.